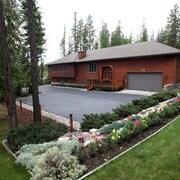 Situated near the airport, this bed & breakfast is 19.3 mi (31.1 km) from Glacier National Park. Where to find Columbia Falls hotels near an airport? Where can I find hotels in Columbia Falls that are near tourist attractions? 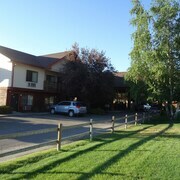 If you decide to stay close to the heart of Columbia Falls, there are a number of accommodations. Columbia Falls offers 7 quality hotels and apartments, all within a 0.1-kilometre (0.06-mile) radius of the town center. There are a number accommodation options that are within a 5-kilometre (3-mile) radius of Columbia Falls' city center, including the Meadow Lake Resort and Western Inn-Glacier Park. 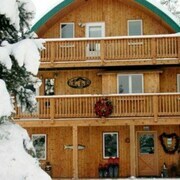 Our accommodation list offers only a small number no-frills lodging options in Columbia Falls. 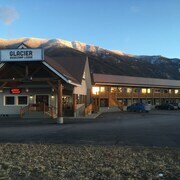 The Glacier Travel Inn is one of them. 18 kilometres (11 miles) from downtown Columbia Falls, is the Morning Eagle. Alternatively, the Kandahar Lodge at Whitefish Mountain Resort is positioned 18 kilometres (11 miles) away. 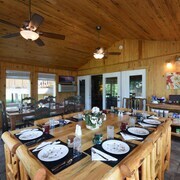 Some other hotel and apartment options in the Columbia Falls area are the Lodge at Whitefish Lake and the Edelweiss Condominiums. Why not enjoy more of the lakes, mountains and valleys that are commonly found in in Western Montana? Choose to spend time in other parts of Western Montana. No matter if you join in with the common regional activities, for example snowboarding and skiing, or simply tour around to explore the area's offerings you will be able to book comfortable accommodation in the area. Coram is found 20 kilometres (14 miles) to the southwest of Columbia Falls. While here, take the time to discover the Conrad Mansion. Those staying in Kalispell have some great options to choose from; the Holiday Inn Express Kalispell and Homewood Suites by Hilton Kalispell, MT. Alternatively, you can stay at Coram, 12 kilometres (8 miles) to the northeast of Columbia Falls. While in Coram, take the time to enjoy the Amazing Fun Center. 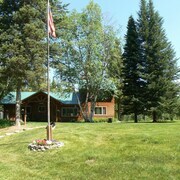 The Historic Tamarack Lodge & Cabins and Glacier General Store & Cabins are comfortable places to stay. If enjoying sport is a favourite pastime, be sure to visit Stumptown Ice Den, which is 13 kilometres (8 miles) to the northwest of Columbia Falls. Those sports fans wanting to stay near to the action can take their choice from the Grouse Mountain Lodge or the Chalet Motel Whitefish. Our destination page is also a very good way to learn more about Columbia Falls. 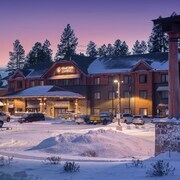 What are the most popular Columbia Falls hotels? Are there hotels in other cities near Columbia Falls? 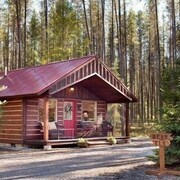 What other types of accommodations are available in Columbia Falls? Explore Columbia Falls with Expedia.ca’s Travel Guides to find the best flights, cars, holiday packages and more!